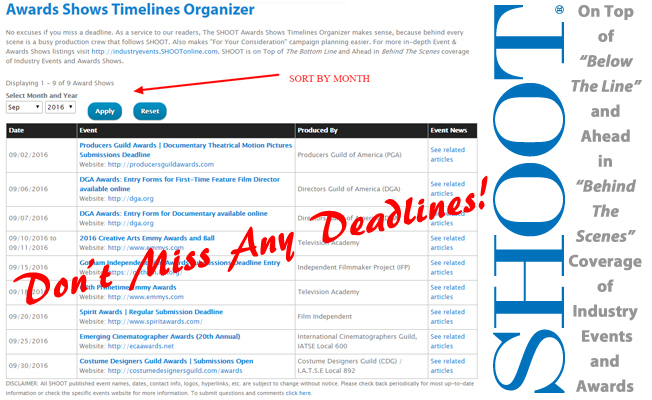 As a service to our readers, SHOOT® Awards Show Timelines Organizer makes sense, because behind every scene, in any type of professional motion picture, is a production crew that follows SHOOTonline and/or subscribes to SHOOT® Magazine. SHOOT's audience includes motion picture artisans such as directors (members of DGA, AMPAS, TTA), producers (members of PGA, AMPAS, AICP, TTA), cinematographers (members of ASC, ICG, AMPAS, TTA), screenwriters (members of WGA, AMPAS, TTA), art directors (members ADG, TTA), editors (members of ACE, MPEG, AMPAS, AICE, TTA), VFX Animators (members of VES, AMPAS, TTA), musicians & audio talent (members IBT, RMA, CAS, AMP, AMPAS, TTA), set director (member SDSA), talent in the Casting department (members of CSA, AMPAS, TTA), locations scouts (members of AFCI, LMGA, TTA), wardrobe & makeup talent (members MAHS, AMPAS, TTA), legal & accounting departments, studio management, owners and agents (members AMPAS, TTA), and of course, the PR talent (some members AMPAS, ICG, TTA). All of whom have their own Award Shows. To bring better understanding to the various guilds and academies members deciding how to vote this year, SHOOT's Annual "The Road To Emmy" series (during Emmy season) and “The Road To Oscar” series (during Academy season) puts the spotlight on the producers, directors, documentarians, cinematographers, editors, production designers, visual effects supervisors, composers and other artisans in the running during Emmy and Academy season awards shows. Along the “The Road To Oscar” SHOOT will cover the award season’s festival circuit (Venice, Toronto, Telluride, et al) and Guild & other industry Award Shows (including the ACE, ADG, Annie, ASC, CAS, CDG, DGA, PGA, SAG, VES and WGA Awards, BAFTA, Golden Globes, Independent Spirit Awards - see list below)--and their implications for the Oscar® derby and what evolves into this year’s field of nominees and eventual winners. Extensive coverage--including the October preview feature. 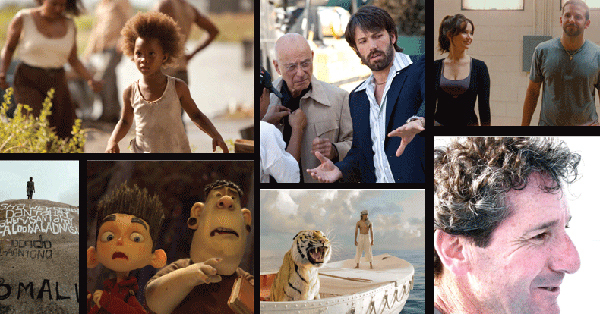 all of the Award Shows leading up to the Academy Awards® and “The Road To Oscar” series-- provide insights into the artists and the artistry behind the latest crop of lauded films. artisans and Oscar®-related news and information that we’ll be covering for the months leading up to the Academy Awards®. Visit https://SHOOTonline.com/FYC for more information on "The Road to Oscar Series" and links to all of last year's installments! To find the latest event information, bookmark http://IndustryEvents.SHOOTonline.com and http://Timelines.SHOOTonline.com : Whether you've produced an Awards Season Hopeful or Contender, are an Industry Awards Show Manager, or an Awards Season Observer SHOOT will keep you up-to-date with the facts. SHOOT® is a vital place to be during Academy season! With the film industry awards season heating up and the Sundance & Slamdance Film Fests, and Award Shows shifting in to high gear, SHOOT readers will be looking forward to our continued preview and wrap-up coverage of all the major award shows. 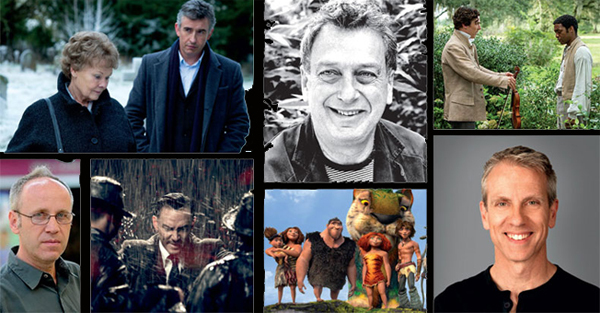 In addition, SHOOT's weekly "Road to Oscar" series continues through March with previews and predictions about films generating Oscar® buzz with insights from select producers, directors, cinematographers and other artisans involved in many of them. With close deadlines and fast turnaround, SHOOT's marketing options include print and banner advertising, publicity release exposure and custom email blast promotion. SHOOT delivers the latest awards coverage for shows, winners, short-listers, and FYC to the motion picture production segments of the entertainment, TV, & commercial production industries including all the event dates, deadlines, contact info, and abstracts with hyperlinks to news & facts coverage for shows, noms, winners, short-listers, etc. "To Connect" is an Overriding Theme and Enduring Tradition at SHOOT® SHOOT’s unwavering mission for more than a half century has been to serve the news and information needs of creative and production decision-makers at movie studios, productions houses, ad agencies, brands and executives & artisans throughout the production industry. 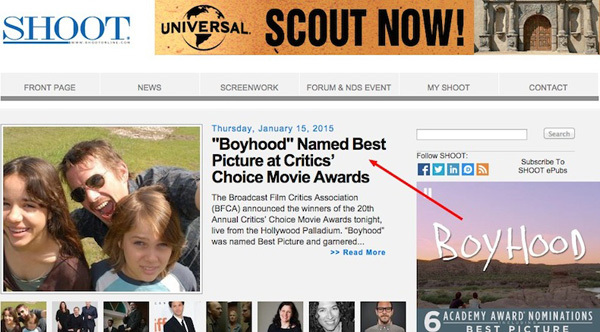 SHOOTonline connects readers to the news, to the best work and to each other. Having fulfilled this objective for such a long time, SHOOT continues to be an indispensable resource while other publications have come and gone. SHOOT has stood the test of time and continues to achieve its mission by reporting the latest news, trends and strategies and by showcasing the best work, and the talented people, techniques and equipment behind that work. It is this balance of news and creative information that has kept SHOOT the number one publication for more than five decades. Major site sections include: SHOOT News, SHOOT Publicity Wire News, Screenwork, New Directors Showcase, and My SHOOT. 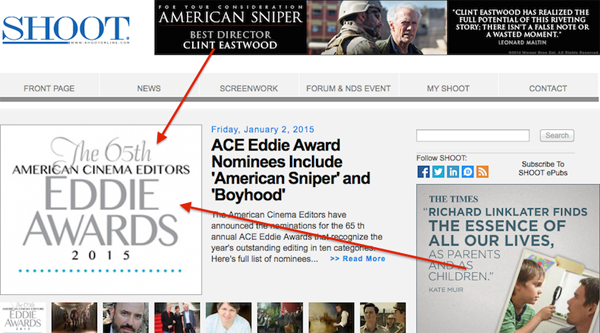 Digital ePubs include: The SHOOT >e.dition, SHOOT Dailies, Brand New[s], and SHOOT Screenwork. With an understanding and respect for the industry that comes from having grown up with the industry, SHOOT continues to build on its strong tradition by regularly introducing new editorial elements. As the entertainment and advertising landscapes continue to evolve, SHOOT takes great care in planning new products, adding new formats, expanding its editorial coverage and circulation reach to make certain that readers’ news and information needs will be met and advertisers’ goals will be realized. Covering commercial and entertainment production & post, SHOOT has the unique ability to explore applicable crossover areas, searching out how these various areas interconnect and influence each other. Feature and independent film, branded entertainment, television and all forms of advertising are part of SHOOT's regular coverage. Those interested in developing successful advertising programs for their brands and their client’s brands will find relevant and insightful information as will entertainment industry decision-makers involved in Film, TV, Online, Gaming & Mobile production. Covering all the news and issues that affect creative and production decisions, we pay special attention to the overt and hidden challenges involved in reshaping business models and working globally to successfully face the challenges of an evolving advertising business and entertainment industry. Follow SHOOT on Twitter, Facebook, and Instagram all @ hashtag #SHOOTonline. SHOOT® Magazine is the leading publication for commercial, branded content and entertainment production covering news, trends, great new work and the people behind the work. SHOOT® Magazine is edited for creative, production & postproduction executives and artisans at agencies, studios, production / post / vfx / animation /music & sound companies; TV, cable, online & mobile networks and brand marketers. Through its "News" and "ScreenWork" sections, "Columns" and in-depth "Features", each issue publishes timely news, relevant information and a behind-the-scenes look at the best new work and profiles/interviews with industry news makers. In addition, SHOOT reports on the latest cinematography, post & editing technology and equipment. If the work involves advertising and entertainment motion picture content that consumers view on a screen---a TV screen, Cinema screen, Computer screen, Mobile screen or Game screen, SHOOT is searching out who's doing the most innovative work and what's coming next. For further information please visit www.shootonline.com.® Follow SHOOT on Twitter, Facebook, and Instagram all @ hashtag #SHOOTonline. Create Instant BUZZ! The SHOOT® Publicity Wire (SPW) is the best place to post your release to amp up the "BUZZ" among the motion picture industries' movers and shakers and beyond. SPW offers guaranteed release publication and exposure via: instant press alerts service; digital feeds to Twitter®, Facebook®, and RSS; placement on SHOOT opt-in ePublications Brand New[s], SHOOT Dailies and The SHOOT® >e.dition. SHOOTonline.com® homepage placement; search engine optimization (SEO); video uploading & hosting on the SPW Channel™ for video player embed into releases and/or external social, viral and customer site sharing use; and permanent placement, archiving and indexing in SHOOTonline's "Industry Database of Record." Information on the service can be found at http://pr.SHOOTonline.com. Follow SHOOT on Twitter, Facebook, and Instagram all @ hashtag #SHOOTonline. © 2016 DCA Business Media LLC. All rights reserved. SHOOT and SHOOTonline are registered trademarks of DCA Business Media LLC. All referenced product names, and other marks, are trademarks of their respective owners.